A roundup of 10 easy potluck recipes to feed a hungry crowd during this summer’s festivities. Skip the store-bought food and make simple homemade salads, pasta, dips, entrees, and dessert that everyone will love! Summer celebrations or gatherings with friends and family are in full swing! 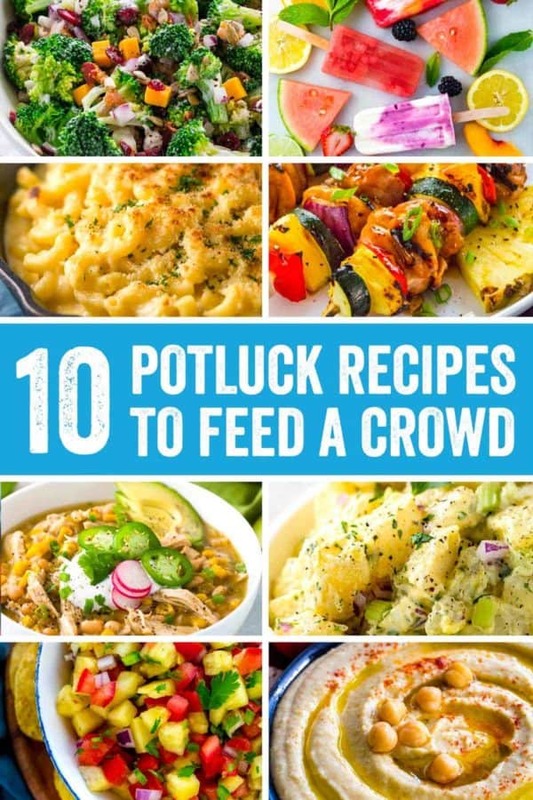 It’s always good to have a few ideas handy for crowd-pleasing potluck recipes. Whether you’re hosting a party or going as a guest, I’ve got a selection of shareable dishes to get you inspired. It’s good to have a variety of appetizers, side dishes, savory entrees, and sweet treats to load up the food table. It’s also a nice gesture to offer some options for guests who are on special diets like Whole30, paleo, or vegan. Many of these recipes can be easily modified. Be the talk of the party with one or more of these delicious offerings. There won’t be any leftovers! Tender pieces of broccoli tossed in a creamy yogurt dressing that’s lighter than traditional versions. Topped with cranberries, cheese, and bacon for a flavorful and healthy salad. This Greek pasta salad is a simple, add and toss recipe made with fresh vegetables and a tangy lemon herb dressing. Add chicken for extra protein. Creamy and irresistible, the essential side dish to have at any summer barbecue is potato salad. If you’re looking for a light version, also try my Greek yogurt potato salad. A healthy protein and fiber packed dip! Made in minutes in a food processor or blender. Serve hummus with fresh summer vegetables and pita bread for a colorful platter. Master the art of cutting a pineapple! This quick fruit salsa dip is a perfect warm weather snack to get the fiesta started. Kids and adults will devour this macaroni and cheese! The crispy breadcrumb topping adds just the right crunch with each spoonful. Smooth and creamy, everyone will be coming back for seconds. It doesn’t get any easier than making chili in a slow cooker! This hearty meal has a kick of heat. You can also switch it up with different types of vegan protein sources, lentils or black beans. These tropical chicken skewers can be marinated ahead of time and thrown on the grill for a quick appetizer or entree. Guests will love the teriyaki glaze! 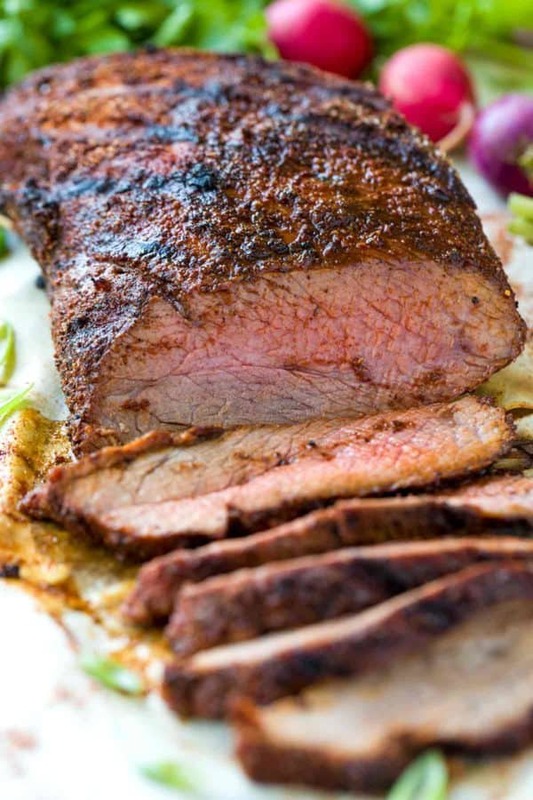 Grilling juicy tri-tip has become a favorite summer staple. The meat gets a generous coating of sweet and spicy rub for extra flavor with each tender slice. End the meal with these refreshing customizable fruit popsicles! Colorful and healthy, the perfect cool treat. Make them a few days ahead so that guests can quickly grab and enjoy! Make sure to keep food safety in mind as we spend more time outdoors eating in the warm weather. From preparation, transporting, before serving, and leaving the food out, check out these barbecue and picnic food safety tips. This practical advice can be applied to any meal occasion, especially when food sits out for an extended period. Thank you; this covers many of the ways for grilling outdoors. The recipes are all excellent. Excellent meatball recipe! I made meatball subs for our weekly “family dinner” with our four grandchildren and even the pickiest little one loved it!